JDaddy and CDog Talking Sports: Marty Ray - Check This Guy Out! 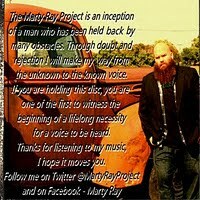 Marty Ray has one of the most unique new sounds around. JDaddy met Marty this morning at a Veteran's Day tribute. Great guy and great music. Click the pic or go to his page on ReverbNation to see more about Marty Ray.